Chicago, West Side, August 27. Photo: courtesy Nader Awad @nawadNYC. The majority of the crowd was young—the men and women (and girls and boys) that the police mess with every day. 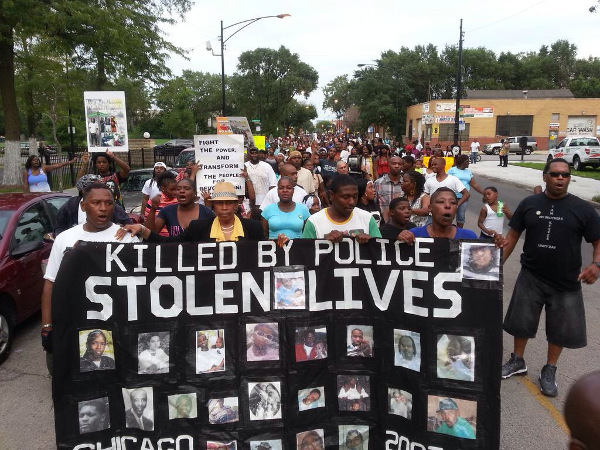 But everyone from the community was out there—and older people marched proudly with their youth chanting "Indict, convict, send the killer cops to jail—the WHOLE DAMN SYSTEM is guilty as HELL!" And "We are not suspects! We are human beings!" Cynthia Lane, Roshad McIntosh's mother, spoke both at the starting point—the site where the young man was murdered—and at the police station when the march arrived there. Her words, and her determined cry for justice, moved many in the crowd to tears as she stood next to the mother of Roshad's child. The call for the march came from the block the day after Roshad was murdered and protestors were attacked while demanding justice. The call was taken up, supported and spread by Tio Hardiman of Violence Interrupters, Inc. together with the Stop Mass Incarceration Network Chicago, and the Revolution Club Chicago. It was also spread through networks on the streets. Marching from the block to the hated Harrison District police station, the people were energetic and determined—starting out on the sidewalk but then taking up the whole street. Youth came off their porches and the street corners to join in. Passing police cars posted along the route, protestors chanted "Hands up! Don't Shoot!" and "Hey cops, quit killing our kids!" Different views on the problem and solution were broadcast over the sound system—from calls to force the mayor to "get the police under control or be voted out" to building a movement for revolution to sweep away the system that is at the root of the long years and daily outrages of the oppression of Black people. A couple of hundred Revolution newspapers went out, with many in the crowd holding them up as protest signs. Hundreds of the Revolution Club proclamation were distributed, and people in the crowd took them up and passed them out. Many spoke to each other about how this unity and standing up—which was inspired by the actions of the people in Ferguson—have to be built on, grow, and spread.